All across the country, a growing number of children are dropping out of organized sports—not because they don’t like to play, but because the system they play in is failing them. 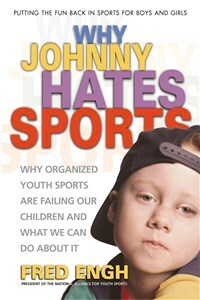 Written by one of this country’s leading advocates of youth sports, Why Johnny Hates Sports explains why many of the original goals of youth leagues have been affected by today’s win-at-all-costs attitude. It then documents the negative physical and psychological impact that parents, coaches, and administrators can have on children, while providing effective solutions to each of the problems covered. Why Johnny Hates Sports is both an exposé of abuses and a call to arms. It clearly illustrates a serious problem that has plagued youth sports for too long. Most important, it provides practical answers that can alter this destructive course. of the Alliance, Engh has appeared on numerous television shows, including Dateline NBC and 20/20. Have you ever looked into the eyes of a child who has been yelled at for simply dropping a ball or missing a tackle? Have you seen his pain? Have you ever watched a child berated by a coach? Have you seen children frozen by the fear of making a mistake and hearing about it from the adults? Have you seen a child reduced to tears by a stinging criticism from a parent or a coach? Have you ever watched as a child begged to quit a sport because the pressure was just too unbearable and playing was no longer any fun? I have seen all of that, and more, and after thirty years of observing sports for children from every angle, I am convinced there is a growing problem in this country, and it must be addressed—now. It’s also important to point out to readers of this book that, throughout my career, I have met hundreds of parents who exemplify model behavior in the treatment of children and demonstrate genuine understanding in how to be a supportive parent. I’ve also worked with wonderful league administrators who’ve volunteered untold hours in organizing sports programs for children, with one thing in mind—making it fun for the kids. And having seven children of my own, I can’t begin to tell you how comforting it was to know that so many of their coaches truly cared about them and the others entrusted to their care. Kids. Which kids are we talking about? When talking about youth sports, perhaps one of the most misunderstood areas is the age level we are addressing. I should make clear at the beginning that this book is focused primarily on the child who may enter the world of organized sports as young as age four and play up to perhaps age thirteen, at which time, statistics show, most will have dropped out. It is mainly within these years that children are learning about themselves psychologically, physically, emotionally, and socially. Their personalities are being molded. Their minds are forming lasting impressions as to the importance of sports in their lives. It is at this level that we, as parents, coaches, and administrators, will play the greatest role in making the sports experience positive, healthy, and safe. We can see that the results of our children’s experiences during these years are crucial, especially when we consider the positive role sports can play in their overall development. We hope our kids’ experiences will be positive, but I must acknowledge that many organized youth sports programs in America today are not so good. Some have been transformed into combat zones where violent behavior is just another part of the game. Parents argue with coaches, abuse officials, and confront parents from opposing teams—often with bloody results. Violence, brawls, fist-fights, and post-game tirades have become an epidemic in youth sports, and it is spilling over into our everyday society, contributing to an increasing display of gangs, violence, drug abuse, and a lack of respect for property and ­people. Recently, in Salt Lake City, Utah, two women assaulted a mother following a youth baseball championship game, leaving the mother unconscious. In Manitoba, Canada, an assistant coach allegedly jumped over the boards and grabbed the referee during a tournament game for thirteen-year-olds. In Whitewater, Wisconsin, a baseball coach for children ages twelve and thirteen was taken into custody on accusations that he had grabbed an umpire, wrestling him to the ground. In Rockaway, New Jersey, a baseball coach was hit with a $1,000 fine and five days in the sheriff’s work program for assaulting a thirteen-year-old player during practice. In Los Angeles, more than thirty adults brawled at the conclusion of an under-fourteen soccer tournament game, leading to the arrest of three parents, including one on suspicion of assault with a deadly weapon. In Hazlet, New Jersey, an umpire and parent were called into police headquarters after exchanging blows at a baseball game among grade schoolers. In Man­al­apan, New Jersey, police investigated an incident in which a youth baseball coach claimed to have been attacked by a father who was upset because his child had not played in a game. And the list goes on and on. Sure, there are many adults who do a wonderful job helping youngsters have positive experiences in sports. But the age-old ideal that children’s participation in games should be fun, and should contribute to physical development and social skills has been buried amid a plethora of police reports, hospital emergency room visits, and arrest warrants. An ever-increasing number of coaches and parents—the most important role models in a young athlete’s life—pay lip service to the importance of sportsmanship, fair play, and fun in youth sports. It’s all too clear that their real focus is on winning—whatever the cost—and their actions at games are speaking a lot louder than any empty words. Studies show that an alarming 70 percent of the approximately 20 million children who participate in organized out-of-school athletic programs will quit by the age of thirteen because of unpleasant sports experiences. That’s 17.5 million unhappy, dispirited children. It’s a frightening statistic that paints a rather bleak picture of organized sports in America today. The culprits are the adults who, in their roles as coaches, administrators, and parents, have misguided motives and ideals of what youth sports are all about. Win-at-all-cost coaches who are obsessed with winning games and championships plague too many youth sports programs. We have all seen these adults—blinded by visions of first-place trophies, playoffs, and post-season glory—prowling the sidelines, yelling at children, and insulting officials. Even worse, many coaches lose total control and get physical—grabbing, hitting, and throwing things—all horrifying examples of what can happen when the adults take over the child’s game. Scoreboards, standings, and championships also bring out the very worst in many parents, who undergo an amazing transformation once they arrive at the playing field. They yell at their child, criticize coaches, and degrade officials who make calls against “their” team. These parents are loud, negative, and disruptive, a terrible influence to every child playing the game. The parents’ perspective can become easily distorted when it comes to the exciting world of youth sports, and their poorly chosen words and actions can cause irreparable harm to children. They have failed to recognize that many of the things that they do to children in the name of sports can actually be considered child abuse. Our sports programs are also overflowing with administrators who have had no training whatsoever in how programs should be conducted for children. For the most part, they’ve been unable to make informed decisions or implement standards and policies that cater to the needs of the young participants. They are one reason why the ridiculous behaviors we see on our playing fields every day have become an almost-accepted part of the programs. A study by the Minnesota Amateur Sports Commission reported that 45.3 percent of the children surveyed said adults had called them names, yelled at them, and insulted them while the youngsters played in a sports contest. It also revealed that 21.5 percent had been pressured to play with an injury. Shockingly, 17.5 percent even reported that an adult had hit, kicked, and slapped them while participating in sports. Much of the blame for such conditions must be attached to the youth sports administrators who allegedly set the standards for conduct, fail to recognize when those standards have been breached, and neglect their duty to discipline appropriately those responsible. Why are youth sports in such a state of disarray? Why in the so-called name of fun do we continue to do things to children that chase them away from the games they once loved to play? During the last couple of decades, professional, collegiate, and even high school sports have undergone a remarkable transformation. Sportsmanship and fair play have become virtually nonexistent, while incidents of cheating, taunting, attacking officials, and running up the score have increased drastically. The attitudes, behaviors, and beliefs that surround sports at these levels have trickled down into youth athletics and spread like a deadly virus across its landscape. Has anyone noticed what’s happening? This book will examine the cultural phenomena we’re experiencing in organized youth sports. No other book exists today that examines in such detail these problems, why they’re occurring, and what can be done about them. It is based on more than thirty years of experience as athlete, administrator, coach, and parent. As you read, it’s important to understand that there are workable solutions available, ones that can be implemented at every level, in every community. We begin with an overview of sports during the last century and how we’ve arrived at the way games are played by athletes and watched by fans today. We’ll look at the behaviors that dominate professional sports as well as issues such as fair play, ethics, and sportsmanship, and how they influence the manner in which youth sports programs are conducted. We’ll take an in-depth look at parents with children involved in organized sports. We’ll discuss their motivations for enrolling their child, examine their roles and responsibilities, explain when they should cheer or “chill out,” and offer suggestions on how they can ensure a fun and memorable experience for their child. We’ll delve into the whole issue of coaching youth sports and cover the characteristics that all good coaches possess, why they often cross the line from stressing fun to winning, and the vital role they play in each child’s life. Then we will look at the children who play these games. We’ll look at what they want from their sports experiences, why they’re dropping out of sports in ever-increasing numbers, and what effect pressure and stress from adults have on their physical and emotional development. We’ll confront the issues that have been a part of organized youth sports since their inception. Particularly for those children younger than ten or twelve years old, what role does winning really play? How can we emphasize play rather than competition, especially for those younger children? How can we avoid pitting the early maturer against the late maturer? Why do children get involved in sports to begin with? The administration of youth sports is often an overlooked aspect, but these behind-the-scenes adults play a significant role in what types of experiences everyone will have. They control the reins regarding policies, procedures, and rulings, all of which impact on the programs we offer our youngsters. Finally, we will offer concrete, realistic solutions that have proven to be successful in communities across the country. At this important juncture in youth sports, too many children are being deprived of fun-filled and rewarding experiences. It’s time to change because we cannot afford to destroy any more young lives. It’s time to put the fun back in sports for kids. For all of us.